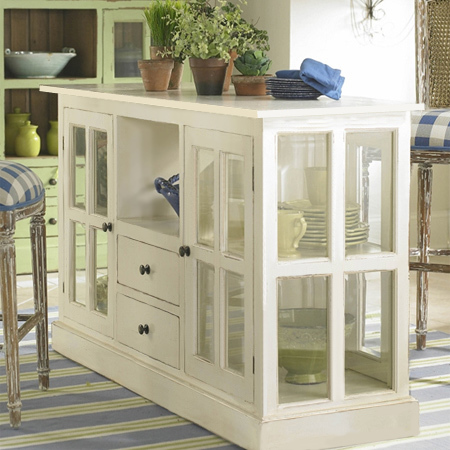 With it glass panel doors, this vintage distressed cabinet is not only useful for storage and display in a home, it also makes the perfect kitchen island in a rustic or cottage kitchen. Made using 16mm SupaWood, you will find everything you need for this project at your local Builders Warehouse. As shown in the diagram above start off by assembling the centre section. 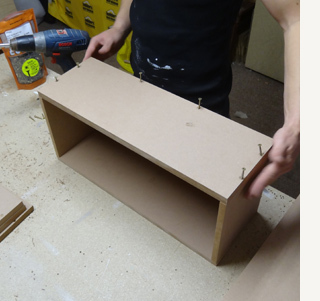 Note that all holes are pre-drilled using a 3mm wood bit at 50mm from the top, side of bottom edges. 1. 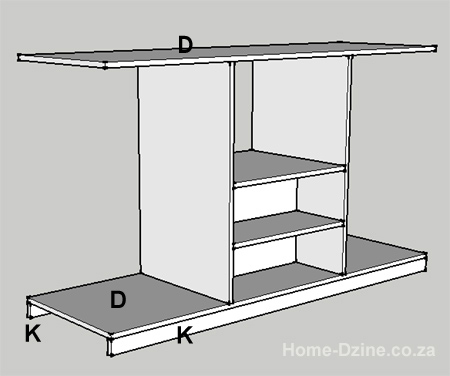 Along the 504mm length, measure in 226mm from both sides and draw a line on the top and bottom of the top shelf [F]. 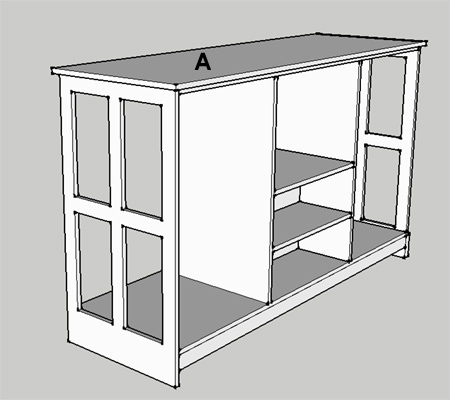 Using this line as a guide, attach the top shelf to the shelf support [G] via pre-drilled and countersunk holes through the top shelf. 3. And then attaching the other side [C]. 5. With countersunk pilot holes pre-drilled along the front edge of the base [D], and pilot holes pre-drilled in the base front and back [K], attach these sections together. 6. Measure in and mark at 449mm in from both short ends on both sides of the base, draw a line, and use this as a guide for securing the base [D] to the centre section. 7. Centre section with base added. 8. Add the top [A] using the same method. Before attaching the side panels cut out the openings with a jigsaw. See Step 12 below. 9. 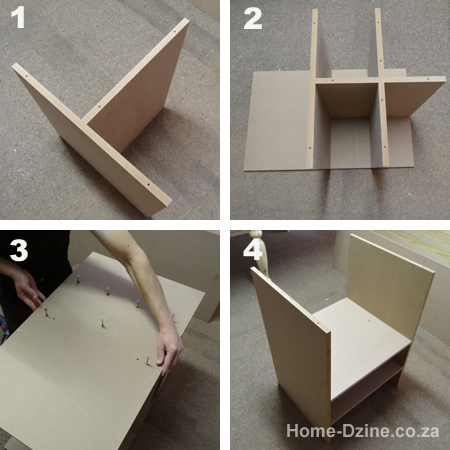 Attach the side panels [B] to the frame by aligning the top edge. 10. Completed frame with side panels. 11. 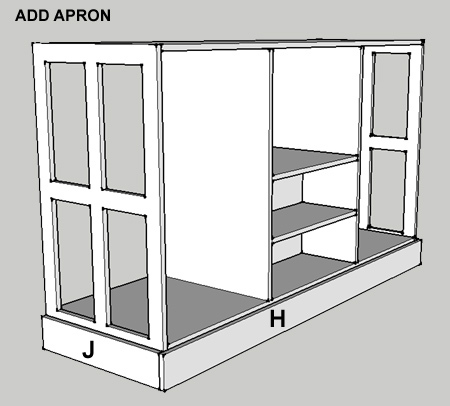 Add the front, back [H] and side aprons [J] to the base of the frame, as per diagram ADD APRON. 12. 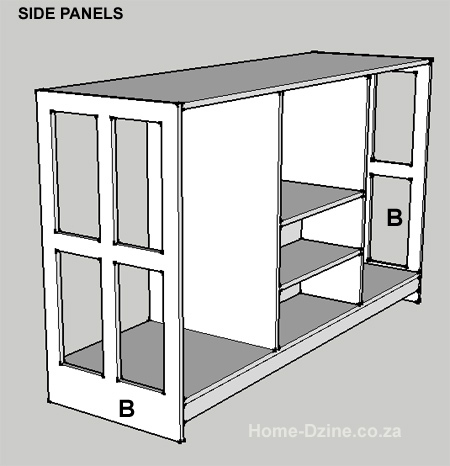 Allowing a 16mm border all round ,attach the countertop to the top of the unit. Pre-drill and countersink all holes through the top into the frame sections. Drill pilot holes and countersink to attach the front and back to the sides. Test fit the drawers and sand if necessary before painting the drawer fronts. 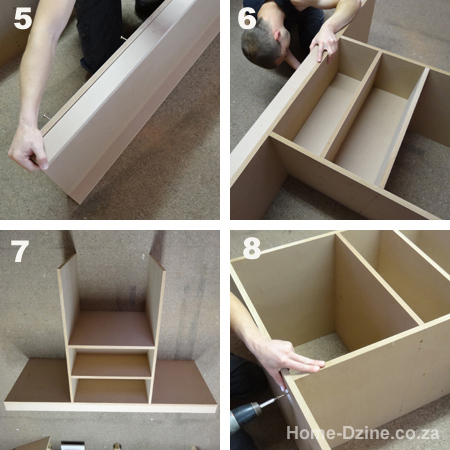 Drill holes in the sides for shelf pins for mounting the shelves [L]. 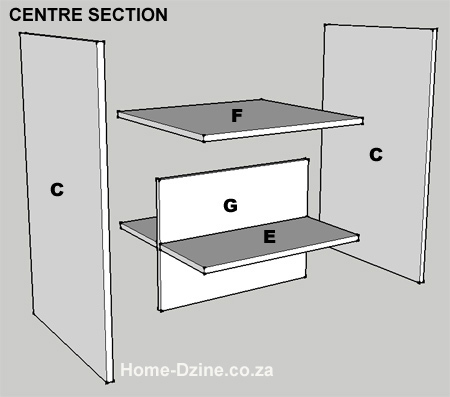 Paint the shelves separately. Before painting you need to sand down all the edges and make sure that everything is nice and flush. Any uneven edges can be sanded with 120-grit and then smoothed with 240-grit. Wipe clean to remove all traces of dust. I prefer to use a Bosch PFS spray system for painting all my furniture projects, but you can use a paintbrush and foam roller if you don't have a spray system - it just takes longer. Apply two coats of paint, allowing each coat to dry before applying the next coat. Sand with 1000-grit sandpaper before applying another two coats of paint and sanding again. 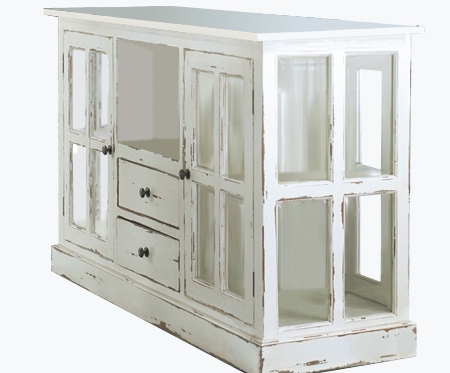 At this stage you can decide whether to leave the unit as is, or to apply a distressed finish to the edges. You would do this using 120-grit sandpaper, either by hand or with a Dremel MultiMax. After sanding, you can apply two coats of clear sealer or antique wax. Before mounting the doors [M], measure and draw a line 50mm in from the front, back, top and bottom edges. Each opening measures 160 x 330mm. Cut out the openings with a jigsaw. 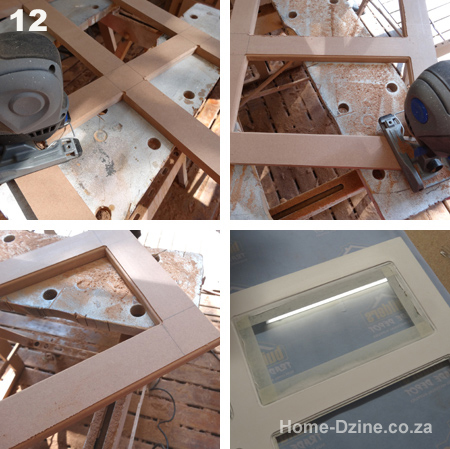 After sanding and painting the doors, place the glass inside the rebated section at the back of each door. Place a strip of masking tape around the edge of the glass approximately 2mm in from the edge. 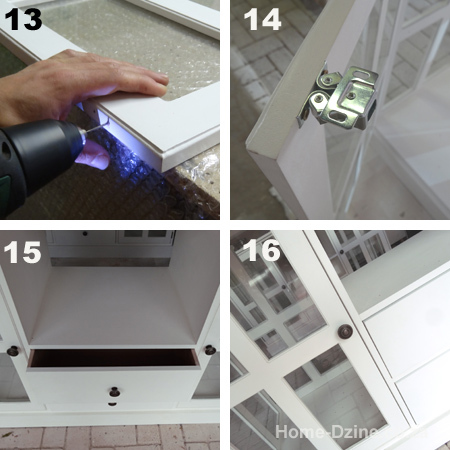 Secure the glass using acrylic sealer and remove the masking tape before the sealer has time to set. 13. Add hinges to all the doors and fit the doors to the frame. 14. Attach double-roller catches - mounted at the top of each door. 15 & 16. 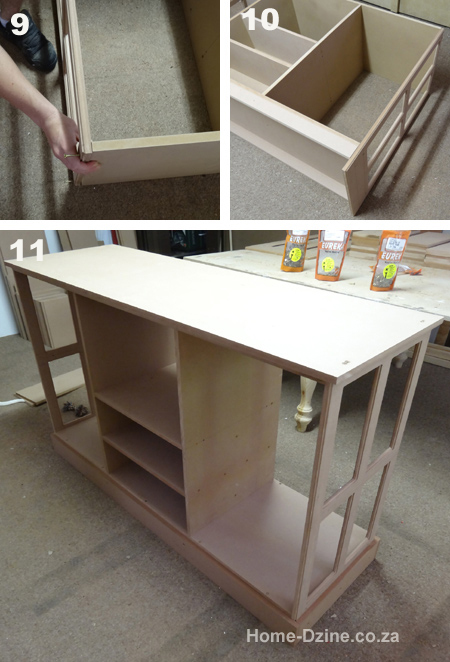 Add handles or knobs to the doors and drawers. Vintage display cabinet with doors open to show hinge mountings. Completed vintage display cabinet. This particular unit has not been distressed, but you can add light, medium or heavy distressing to suit your particular style and taste.